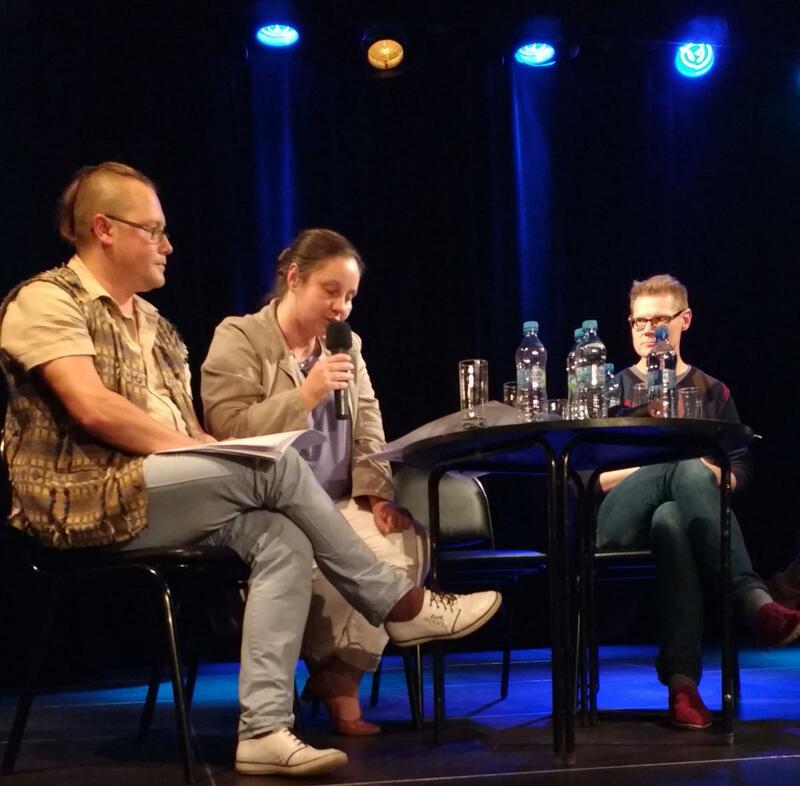 On a crisp, mid-September night in Łódź, Poland, the Dom Literatury w Łódźi hosted four poets in a bilingual reading: Przemysław Owczarek, Monika Mosiewicz, Mark Tardi, and Kacper Bartczak. The atmosphere was intimate and jovial. The deep magenta walls of the theater felt warm, lit as they were by the occasional wall fixture and by a soft strings of lights which lined the demi-moon shaped bar in the back corner. Small circular tables welcomed around fifty audience members while the four poets cozied up around a larger table onstage. As everyone was settling in there was a lot of conversation, clinking of glasses, and some laughter spilling in through the door from another event just wrapping up. Even during the reading there was a side conversation or three—hush-whispering—but it didn’t feel distracting for two reasons. First, the sound system was solid. Second, the performance was dynamic and interactive. The audience’s conversations felt like a part of the performance. Rafał Gawin’s introductions helped set the mood. With Paweł Wodziński, he had the whole audience laughing. 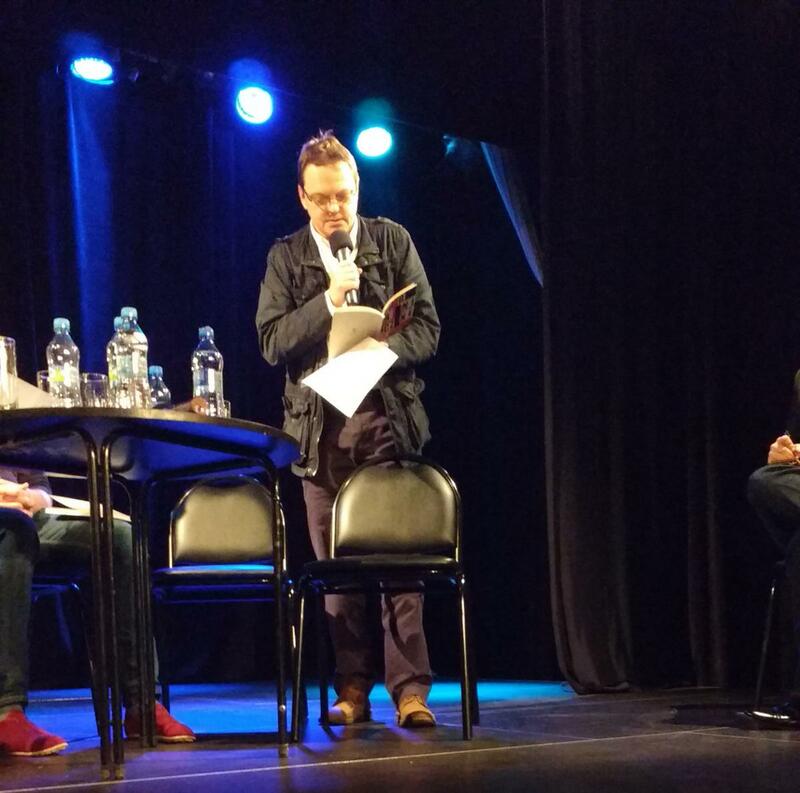 The poems for this reading had been translated in advance, but Paweł, sitting in a chair stage left with a small pad of paper, provided real-time translation of the introductions and interstitial banter. 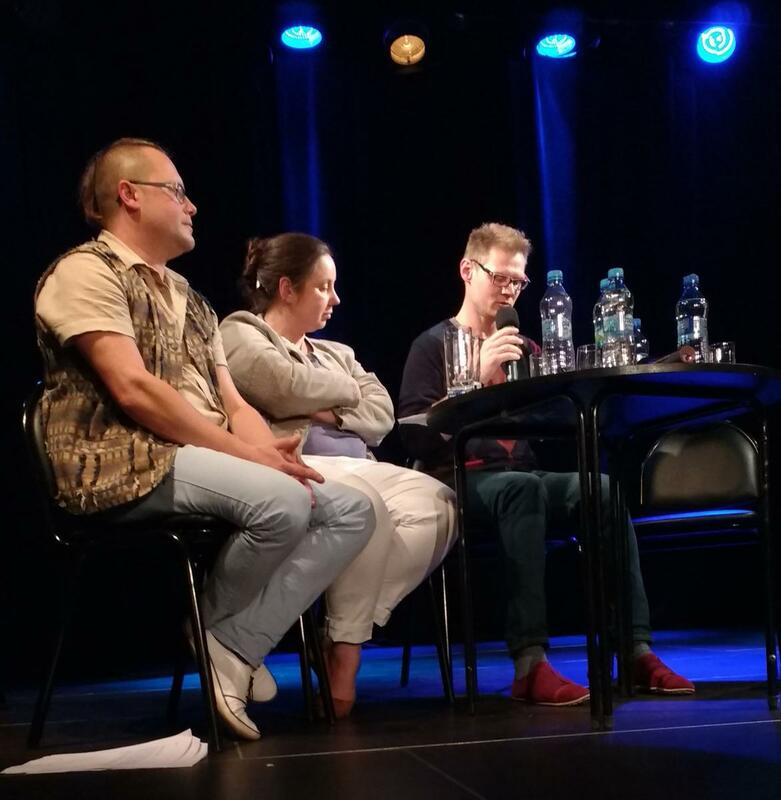 The translation delay added to the comedy: Rafał would make a joke and the Polish-speaking audience would laugh while Paweł scratched furiously in his notebook. Then the English audience would have an interpretation of Rafał’s friendly teasing. 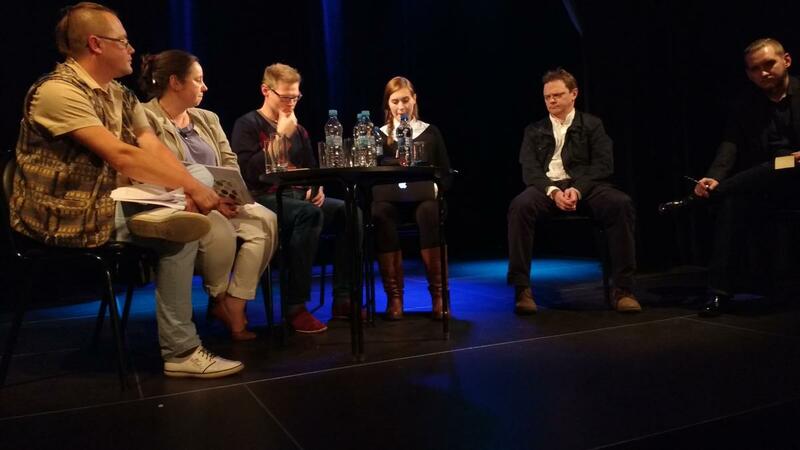 Because each of these poets is connected to the Łódź writing community, the event had the feel of a house reading. In his opening commentary, Kacper mentioned that he had just signed a joint resolution to produce literary programming with at least thirty percent women. Because that night’s event didn’t meet the quota, he said, he had asked permission to still participate. After the reading I spoke with Paulina Ambrozy, an American Literature scholar at Adam Mickiewicz University, who explained that in Poland, the generic category for the poet has always been male, an association that persists. Paulina explained that the resolution came about after a scandal for a major award in which all five of the nominees were men. Someone (a woman) went back and collected data from the previous ten years’ awards, showing that most have been awarded to men by predominantly male juries. The resolution seems a necessary step, though a thirty percent threshold and a focus only women feels like a pretty small step from the outside. 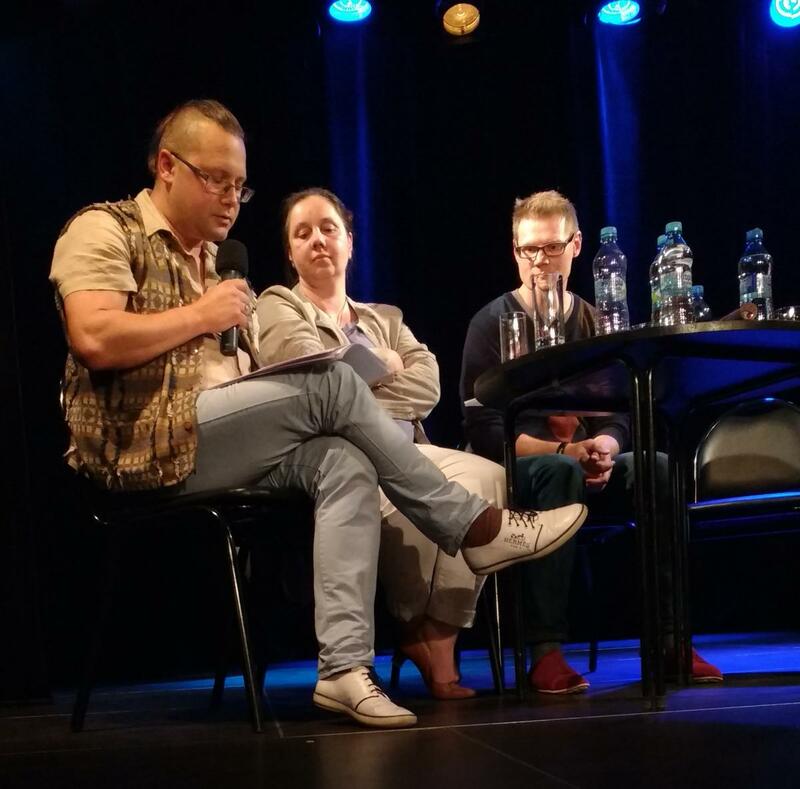 After the reading, Przemysław, who is the director of The Literature House of Łódź, stated that in order to understand the richness of the city’s literary culture, it’s necessary to know its history. As a cultural anthropologist, Przemysław knows how the literary landscape has mirrored Łódź’s development. The Polish sensibility, he explained, dictates that if you have success, you’re bad. Polish people will be jealous and want to pull you down. However, he added, Łódź is different because it was built in the nineteenth century, in the flow of modernity and capitalism. The growth of the town was supported by the work of Jews from Russia, Poles, Germans, and the Russian administration. “Here,” he said, “it doesn’t matter if you’re Polish or a Jew, but if you innovate, you’re good. This is the main idea that connects our city to the US.” The city’s infrastructure reflects this connection. There’s “no market like Krakow’s marketplace to sell vegetables.” Instead, Łódź has a Main street just like many U.S. towns. Przemysław sees this linear urban planning as an indication of the forward-thinking scene in Łódź, which shows up in the arts. “Before World War 2,” he continued, “we had a fantastic avant garde movement.” Łódź was the first place in Europe to have a museum of modern art, and the second place in Poland to have a museum of avant garde art. He told me that the avant-garde movement in Poland paralleled that of France, but with the difference that Polish writers believed the artist could continue constructing with their conscious imagination after drawing material from the unconscious. “Automatic writing wasn’t finished,” he explained. The Łódź chapter of the Polish Writers’ Association and the Dom Literatury w Łódźi have been long connected. Andrzej Strąk was the director of each organization in succession. When he moved from the Polish Writers’ Association to the Dom Literatury, he brought a team with him, including Rafał Gawin and Przemysław Owczarek. It was Strąk’s mentorship of these younger poets that has had such a large impact on Dom Literatury’s recent flourishing. At the ceremony for the award, Przemysław protested. According to Kacper, “He put on a clown’s cap and went to the stage and said ‘You want your priests? I am your clown. You have made this guy into a priest and I am your clown. What are you doing. The prize title is for diversity!’” Andrzej Strąk, the then-director of Dom Literatury, had been the judge that year. There was a rift along generational lines. Older folks in the community sided with Strąk. City authorities stepped in and ousted the director. It was a traumatic time because everyone likes him. At first, people thought Przemysław would be fired from Dom Literatury because he had precipitated the scandal, but instead the city posted the director job position, Przemysław applied, and he was hired as the new director. Strąk remains a part of the Dom Literatury to this day and continues to lead workshops. But during a time when Poland as a whole is struggling with far-right extremism, the Dom Literatury has Przemysław Owczarek at the helm: a strong, anti-fascist leader who isn’t afraid to stand up for what’s right.